Leslie™ Pinout Data | MOSweb Online! This document covers the 5, 6, 9, and 11 pin STANDARD systems used by Leslie™. Pay special attention to the model’s listed in each section, as there are a number of Leslie™ models out there with “nonstandard” interfaces. Connect Hammond™ tone cabinets to later model Hammond™ Organs which no longer needed the B+ supply from the cabinet. “Daisy-chain” older Hammond series (21H, 22H, etc.) Leslie™ Cabinets. Despite all these applications, the 6 to 6 cable is far more common and is recommended for new work and as an upgrade to older instruments. In these cases the “extra” pin is simply left open and unconnected. 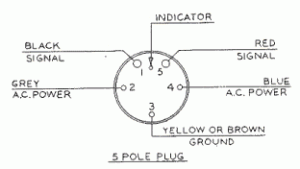 Since a 5 pin plug to 6 pin socket cable is used in the above applications, I have provided the “6 pin” column below to illustrate the wiring of one of these “5 to 6” cables. each for a different family of tone cabinets. 242 and current 122A. NOTE: Early “30” series models below serial number 5200 were not designed to be used with a console connector kit. They must be connected to a Hammond Tone Cabinet socket unless they are modified by the addition of blocking capacitors on the input, or one of Leslie’s original adapters (NLA) is installed. and un-amplified cabinets such as the 110, 112, 114, 116, 120, 120C, etc. which uses the same pin arrangement but required a different audio signal to operate. Where an “Unbalanced Interface” model can be driven by an amplifer, Amp Driven cabinets need to be driven by an audio amplifier’s output in order to be heard. Actually a derivative of the Unbalanced interface. Wiring has been rearranged to allow two audio inputs instead of one. This was done to accommodate Conn’s two channel organs. Again, this system found it’s way onto other organs, for example the Hammond A-100. Includes Models: 50C, 55C, 51C, 251, and 351. NOTE: The Model 55C has no tremolo relay and pin 2 is not connected. With the 55C, tremolo is accomplished by switching audio channels at the organ. NOTE 1: On 2 channel cabinets, pin 3 acts as one half of the AC power (MAINS) and as one half of the Tremolo Relay circuit. On these models it is necessary to connect whichever “side” of the mains is attached to pin 4, to a speed control switch. The circuit is completed by routing the power from the switch to pin 2. The largest change in the 9 pin interface is the addition of independent Slow and Fast control. This allows the selection of Slow, Fast, and Stop. This interface applies to the models 760, 770, 825, 825U, 830, 900, 910, 925, 950. EXCLUDED MODELS: Models not included above are not interchangeable with the models/types listed, each one having its own unique pin-out. All later and current Leslie designs have eleven conductor cables. Current laws do not allow AC power to be supplied from the console and this system provides signal and control voltages only. (All eleven pin Leslie models have separate power cords.) Some pins are not connected in models with fewer channels or features. I’m a mod on Organ Forum (and a few others!) and often refer people to these pages for very useful info. BIG APPRECIATION to the “runners” of this site. What a help for all Leslie and/or Organ-users out there! Thank you guys and keep going, please ! I just found the information I was looking for. Thank you people! Very nice.